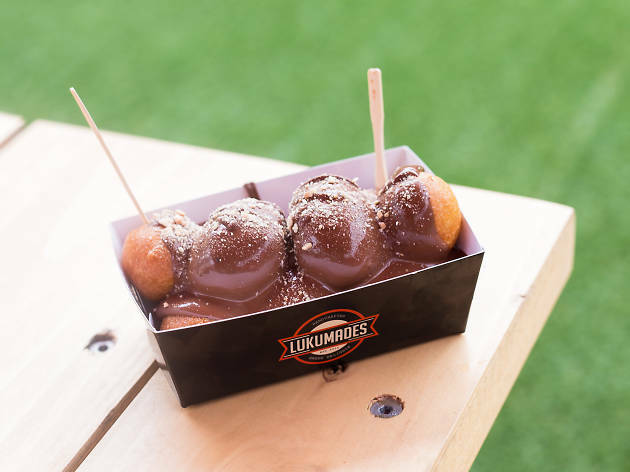 Much loved roaming food truck Lukumades has opened their first brick and mortar store in West Melbourne, right across the street from Queen Victoria Market. They make doughnuts the old fashioned Greek way. Instead of deep frying these doughy mouthfuls, they shallow fry them, rolling them around in hot oil until they’re golden brown. 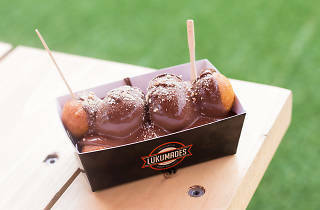 It’s $10 for a serving of around eight, which can be topped with anything from honey and cinnamon to Nutella and crushed biscuit. Try the Twix Fix, with melted milk chocolate, salted caramel sauce, crushed Twix and vanilla bean gelato, or there’s a peanut butter and jam one that’s sticky, sugary and just the right amount of sweet. There’s a vegan option that’s doused in maple syrup, and they’re working on a gluten free version. You won’t find their goods on a takeaway menu, however. It’s because Lukumades are sticklers for freshness, and after you’ve scoffed down a few, you’ll understand why. They’re just dense enough with a slightly crunchy outside, and golf ball sized so you can down one in one bite. The flavours aren’t subtle and neither is the store. It’s a hole-in-the-wall beside an alleyway, coloured mostly in orange, white and neon lights. There’s a small amount of seating inside, otherwise nab a stool in the adjacent alleyway. Coffee by William De Nass Coffee Roasters is available, as are vanilla and Nutella milkshakes. The store is open late too, perfect for a little post-dinner sweetener. Just make sure you’ve left a little extra room for dessert.